Wow – I love eggplant! There is nothing like a nice “meaty” eggplant to make your mouth feel excited about a meal. I never used to like eggplant unless my mother-in-law made it. She has a way of slicing the eggplant just right, adding the right amount of breadcrumbs and frying until a nice golden brown on both sides. My mouth waters at the thought of it. The problem is, it took quite a bit of oil to fry up one eggplant. My taste buds like it, but my waistline didn’t. 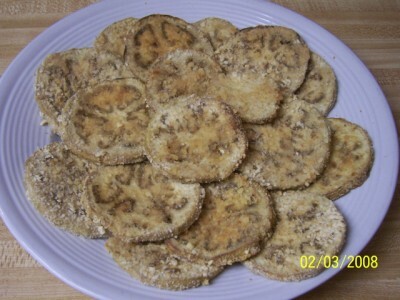 For years, I’ve tried all different ways to cook sliced eggplant that would taste as good as Nana’s without all the oil. Well, I finally did it! It took a lot of patience (to get the recipe right) and a little luck. Normally I don’t keep saltine crackers in the house, but after a mild case of the flu, we had a sleeve or two left. Once I was feeling better, I remembered my mom using crushed saltines in a variety of dishes and I remembered my mother-in-law using mayonnaise and crushed corn flakes to coat chicken breasts before baking. WOW! I just had to give it a try! Start with some nice fresh eggplant. 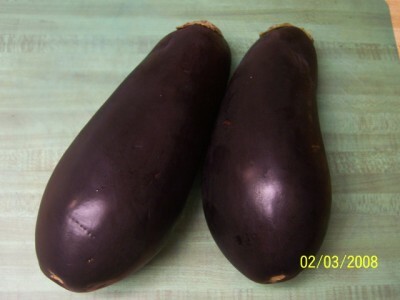 When purchasing eggplant, look for a shiny, dark skin free of most defects. You will also want to make sure the top is nice and green as if it were just fresh picked. If eggplant is on my menu, I will bend these rules, but if I am just thinking about it while shopping – I never bend the rules! Dark, shiny, firm, green top! 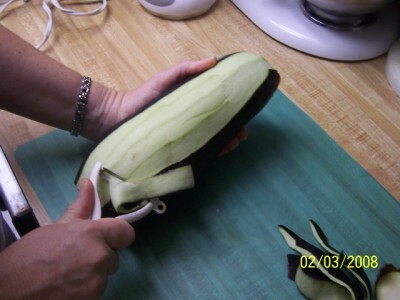 I always start with slicing off the top and bottom of the eggplant. The top often has thorns – so be careful. You can see, I don’t take much off when preparing them. Why waste any part of a good eggplant! I love my y-shaped peeler. It really works well on eggplant – if its sharp. If you notice the peeler is dragging and rubbing, rather than peeling, stop. Clean the peeler and begin again. 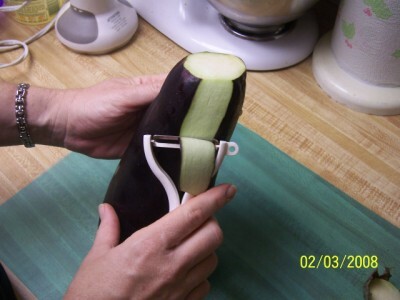 If that doesn’t work, it may be time to invest in a new peeler or it may be that the eggplant isn’t as firm as you thought. If you don’t have a y-shaped peeler, a regular peeler should work fine. 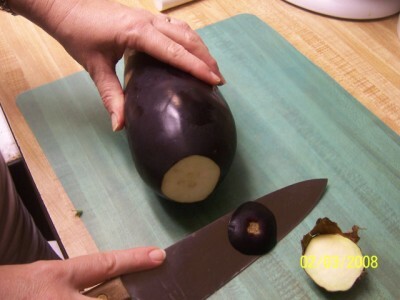 Eggplants are fairly straight and long, like a carrot, so the traditional peeler should work. I have tried doing this with a knife, but I lose too much yummy eggplant that way. 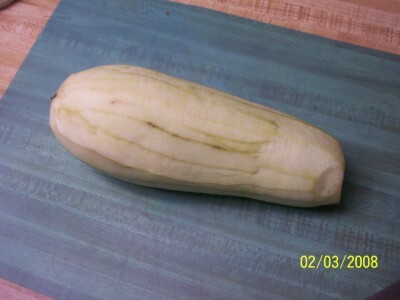 A nicely peeled eggplant just waiting to be prepped. Don’t worry about the slight bit of green left behind. You can eat the peel of an eggplant, so it won’t hurt you. I peel the vegetable because of the texture. My little ones aren’t very fond of eggplant skin and it can often be a little tough. Now it is time to slice the eggplant. I normally slice it about 1/4 inch thick. You don’t need to get out a ruler, just make sure most slices are the same thickness. You want to make sure each slice is fully cooked at the same time. A very sharp knife helps with this step. 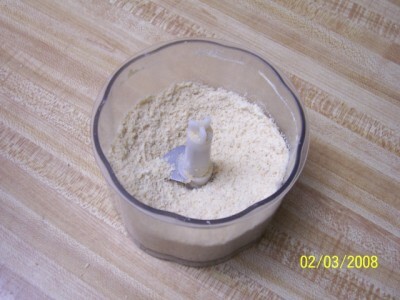 Sometimes recipes call for salting the eggplant and letting it drain – supposedly this reduces the bitterness. I have NEVER done this with an eggplant. 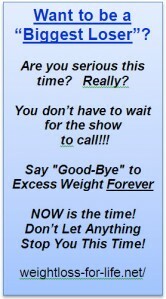 I don’t have the time and have never found the taste anything other than delicious. I think the key is learning how to properly select a fresh eggplant. Now that the eggplant is peeled and sliced, it’s time to prepare the coating. 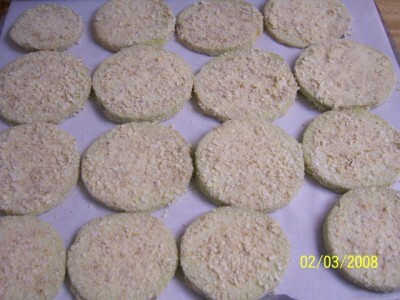 I have tried lots of ways to bake eggplant slices, and this is my favorite coating. I happened to have some saltines left in the house after one of us had a stomach bug, so I decided to try cracker crumbs instead of bread crumbs! YEAH! It was delicious. 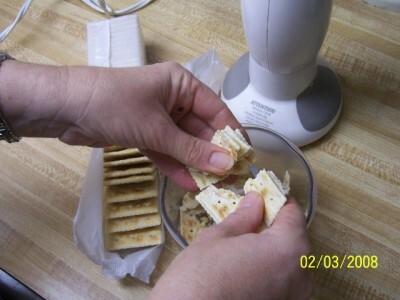 I have done this with any type of cracker and it works well. 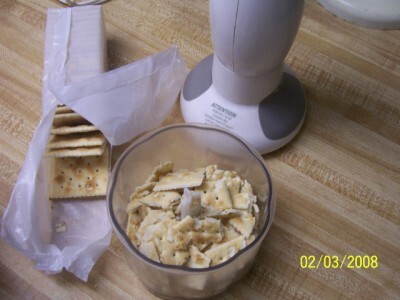 Process the crackers until they are a medium-fine consistency. This is a matter of personal preference. 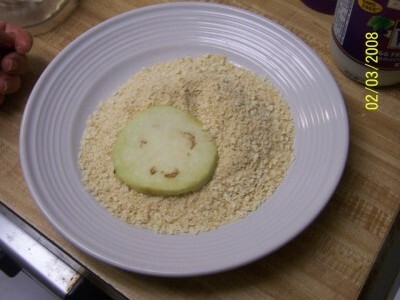 Place the crumbs in a bowl or on a plate. Now that the eggplant and crumbs are ready, break out the vegenaise or mayonaisse or nayonaise or whatever you have at hand. 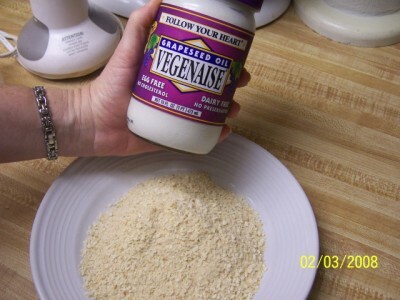 Veganaise is our favorite. We tried quite a few to get one we all agreed on. 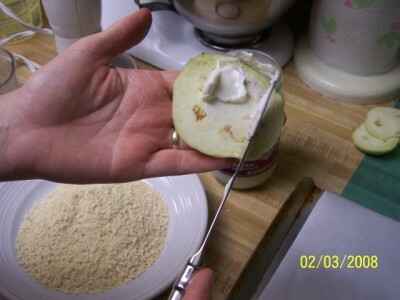 Spread a very thin layer of vegenaise on each slice of eggplant. Start with vegenaise on one side. 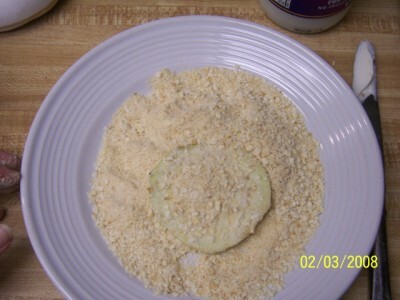 Place the eggplant slice, vegenaise side down, on the cracker crumbs. Gently, add a thin layer of veganaise on the other side of the slice. If you try to do this while holding the slice, it can get pretty messy. 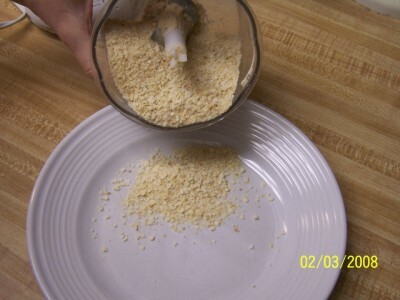 Using your hands, or a spoon, sprinkle cracker crumbs on the freshly “veganaised” side. After thoroughly coating the slice of eggplant, place them on a cookie sheet. You can place them with sides touching. I like to line my cookie sheet with parchment paper to make clean-up easier. Once the cookie sheet is full, place it in a preheated, 400 degree oven. (This is a pretty forgiving dish, so if you have something else cooking at a slightly higher or lower temperature, just adjust the cooking time.) The slices need to cook for between 10 and 15 minutes per side. 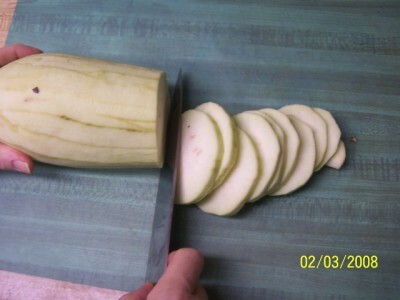 Once done, remove the slices and serve immediately. I like them plain, but my family members will sometimes dip them in ketchup, marinara sauce or ranch-style dressing. I also love them the next day, right out of the fridge. I like to eat them with a large dollop of fresh hummus on top, or they are a great topping for salads, too.